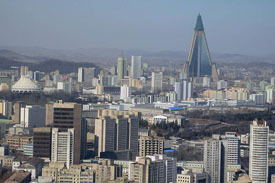 On April 5, North Korea launched a rocket that it says carried a communications satellite to space. But some countries say that no satellite was launched into space, and the rocket just fell into the Pacific Ocean. They believe this was North Korea’s way of testing its long-range missiles. The U.N. Security Council, an international peace and security organization, expressed disapproval for North Korea’s rocket launch. All this has angered North Korea and it has decided to turn back on its nuclear reactor. North Korea has nuclear technology that can be used to create bombs which can hurt many people. This has caused a lot of concern around the world. A group of countries (South & North Korea, China, Russia, Japan, and the United States) got together a few years ago to negotiate a deal with North Korea to give up its nuclear program. A deal was agreed upon where North Korea would shut down its nuclear reactor in exchange for some aid. North Korea started following through with its end of the bargain, though not as fast as it had promised. North and South Korea were part of a single country called Korea for over four thousand years. In 1910, the Japanese occupied Korea and ruled it until the Second World War. When the war ended in 1945, the Japanese had to give up control of Korea. Korea was then occupied by the Soviet Union in the north and the United States in the south. A line in the middle was drawn and two countries were created in 1948 – North Korea and South Korea. In the past, North Korea has not gotten along with either South Korea or the United States, but in the last couple of years, all three countries have made an effort to improve their relationships. In May 2007, trains went between North Korea and South Korea making history because no trains had crossed that border for over fifty years! In February 2008, New York Philharmonic, a famous American orchestra, performed in Pyongyang , the capital of North Korea.